Thursday, March 7, 2019 – 5:30 p.m. to 8:30 p.m. 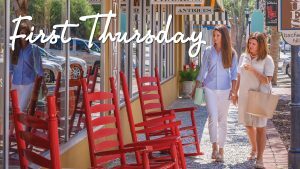 Please join the Main Street merchants and the City of Walterboro in a new program called First Thursday. On the First Thursday of each month, East Washington Street will be closed to traffic from 5:30 pm – 8:30 pm. Come downtown to shop, dine, and play! Musical entertainment will be held at the Waterfall Plaza! This is a free event. Christan Spires (843) 538 – 4353.